Watch Jacob's great speak from #TexCph - Using football to reconcile people torn apart by war. And to any TED talk newbies, discover all the amazing speaks from around the world, surrounding TED's topics: Technology, Entertainment and Design. Search any given branded hashtag on Twitter from your favorite shoe brand, music band to your soccer team, and you will see people talking about it. Try to Google the tag or brand, and you will see videos, pictures from various social networks, posted by users, consumers and fans all over the world. Having conversations around your brand is what any company dreams of, but yet only few uses it for much other than support issues and marketing surveillance. Data is the currency of the web, and the more traffic you have the better. The problem is that most of the content produced by a global audience is spread across social networks, and not owned or utilized by the brands or events. Gignal solves this in various ways. First we store the branded buzz, otherwise lost when it’s out of the social network cache. For Twitter that is a few days and Ftwo days and Foursquare 2-4 hours.? Third we present the content in streams that engage and entertain, and more esthetic than the average stream. We also allow brands to use their design guidelines when setting up Gignal, to match their corporate identity. And finally we measure, when people are posting content, what they are posting and how much content they produce on every social network. This gives a brand or event the opportunity to amplify their buzz, by claiming it, hosting it and presenting it. People trust other people more than brands, so by letting customers tell other customers whats so great about your brand, or let them share their defining moments - trust is build, especially when it’s the brand that proud enough to buzz out loud! More posts on sharing: To Share Or Not To Share! The sport industry is still reluctant to utilize social media to amplify their events and to share the social experience at stadiums with the rest of the world. The potential is notable, and aligned to the core purpose of sport - engaging communities of passion. Imagine sitting at a stadium experiencing the atmosphere that has drawn people to arenas since the time of the gladiators. What we experience is a collective relation with the people we share that moment and passion with offline and online. And collective relations are as powerful for people as intimate relations with our spouses and relational relationships with friends. It is that collective experience we want to support with Gignal, engaging audiences at physical locations and around the world. So with 2012 in front of us, what can sport teams and venues do to amplify the collective experience and engage their audience? From Gignal’s perspective a lot can be done, with or without our stream - here is five low hanging fruits just waiting to be picked. 1. Micro-reporting It is no longer only the television- and radio stations that report live from a game, the most active reporters are the audience, with thousands of mobile phones they are standing in the front line eager to report the atmosphere, emotions and defining moments to their network. They share their experience trough pictures, videos and status updates, viewed by friends and fans outside the venue that did not have a ticket. To engage the audience as pitchside reporters, interaction with the team, the players, the coach and the venue is key. We already see sport stars on Twitter and Facebook, but much more can be done to make the audience share their experience. Through the social media stream on physical screens at the stadium, the audience can monitor the collective participation, which makes them aware of their role as a micro-reporter. And the audience watching from home, can follow the social media buzz online, as if they were standing in the front line them selves. 2. Cross media experience The audience are multitasking even when they are at the stadium watching the game. They follow the action on the ground, on the billboard, on their phones and on screens at the tribune. At home the TV or radio is on, and so is the laptop where the fans can search for further information and interact on social networks. The social media stream is not competing with TV or radio, on the contrary it presents the audience experience rather than a reporters, making it an ideal supplement for a cross media experience. 3. Engage communities of passion Football teams describe the 12th. player as the audience. If the audience is engaged and cheering for their team, they empower the players. Through the stream on stadium screens, the coach can send a message to the audience - to make them roar their support to the players in crucial moments. The team players can send messages before and after the game, to create buzz and to thank the audience directly. There lies an incredible power in audience engagement, because in the end it is all about stimulating communities of passion, to create a memorable social experience. 4. 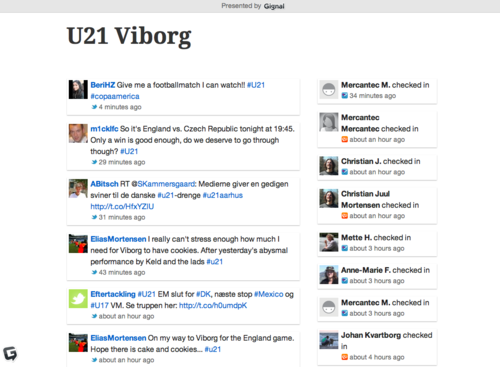 Social media stream - before, during and after the game. During games we are often able to watch a live video stream, but sport teams tend to forget that fans talk constantly about their team, upcoming games and their expectations. 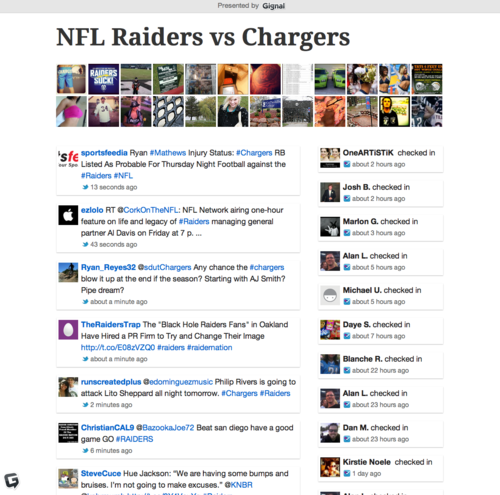 It would be easy and obvious for sport teams to have a “Live” area on their website, so fans can click and see the real-time buzz, produced by fans and the team across social networks. Gignal provides a widget, making it easy for clubs to host and present all the social media buzz from a geo tag and hashtags on their own website. Not only will it be easier for people to find the buzz, it also brings the traffic back to the clubs, instead of keeping it on the social networks. 5. Real-time marketing When a fan checks-in to a stadium, writes a tweet or takes a picture, we know where they are based on the geo tag. This is also the ideal time to market and sell merchandise, tickets and other location based goods, to a passionate and captive audience. During the heat of the moment it us much easier to sell tickets for the game next week, merchandise and beer at the pub after the game. Some clubs are seeing this potential, one of them are Real Madrid, that has been working with mobile marketing for a while. With Gignal, sport clubs can present these time limited offers on the stadium screens, reaching a captive audience, that are much more willing to press buy while they experience the atmosphere in that given moment. Every brand is media company Every organization and brand is a media company. But since this is not their core business or skill, utilizing the new media opportunities can be difficult for the people involved. We want to make it easy for sport teams to gather, host and present all the buzz that surrounds their brand, so they can be in charge of audience involvement. 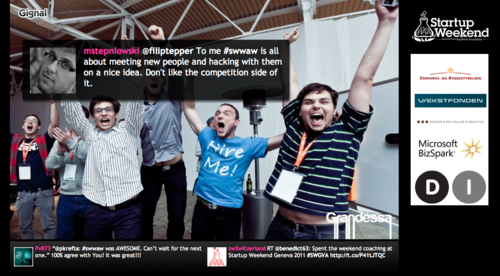 Gignal at Startup Weekend Copenhagen 2011. Friday the 18th. 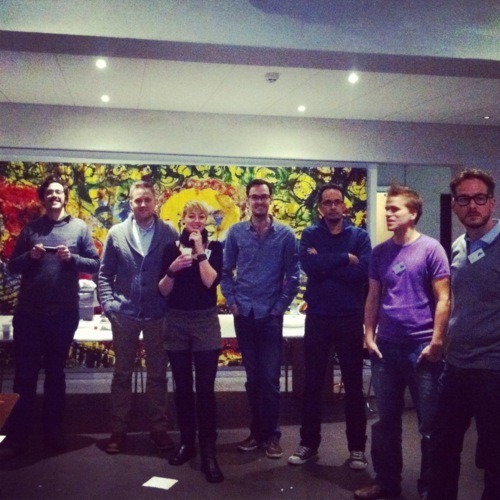 November 2011 our team joined Startup Weekend Copenhagen. We wanted to participate to meet and work with new talents, build a new frontend for our stream and get business strategy feedback. Friday evening after our pitch 8 people were gathered ready to execute. After midnight the weekend was planned and smaller teams organized based on peoples skills. Our desktop stream. "Before Startup Weekend"
Saturday morning our focus was to create the design describing the user scenarios, address use case questions and sketch the first mockups. Ray - our designer worked intensely until the first design was ready at 2 pm Saturday. Now the developers could take over, Mariano, Morten on the backend and Signe on the frontend. With the design in place Jesper and Kevin could also start to work on our video - presenting Gignal in action at a stadium. Niels and I worked on our use cases, market research and business model. Saturday was mentor day, where we met with great mentors, giving us feedback and introducing us to valuable contacts. Saturday evening the first version of our billboard version was ready - boosting our energy after twelve hours of intense work. A late evening turned into Saturday night fewer and after few hours of sleep, for some on chairs and on the floor, we were ready to work on the final version and our afternoon pitch. On Sunday all the small pieces were put together, the last touch on the stream and a few more designs for later progress were in place - we were as ready as we could get with the design, the stream, the video and the pitch. And this is the result of a weekend of work. Kevin and Jesper did an amazing job with the video - presenting Gignal Stadium. After the pitch we used the rest of our adrenalin to celebrate, relax and look back at an awesome weekend. We have created a special branch for Startup Weekend on Github, so if anyone wants to hack feel free to be creative and please show us your work. 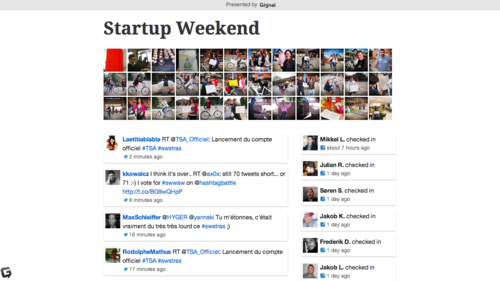 All this was only made possible by the great team organizing Startup Weekend and our amazing team! Even though we had hours of fatigue and last day stress, the team spirit was high and the collaboration was admirable. Proving ones again that teams drive progress not individuals, it was a true honor to be a captain on this team - thank you Signe, Mariano, Niels, Kevin, Ray, Jesper and Morten! So said Kevin Kelly, Senior Maverick from Wired in June 2011, and we certainly agree! But what is it about the stream, why do we follow it daily on our devices and where will it take us in the future? We are constantly exposed to tremendous amounts of data across our social networks, when friends and followers distribute pictures, videos, links and messages. 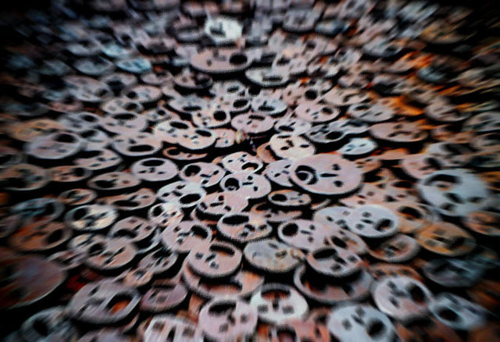 The only way we can qualify the content is by scanning it briefly, deciding what message in the stream will get our attention, while the rest will be lost and forgotten forever. But that’s how we navigate through the flood of information - the stream is constant but our attention is random. We screen, we pick and we participate when it makes sense, and ignore the rest. True qualification of content still depends on humans cognitive skills, no algorithm can replace that - yet. Until that happens, which might take a while even in Internet years, our remedy is the stream. One of the big challenges in data qualification is that robots cannot anticipate what an individual defines as value, nor which topics will be relevant to us tomorrow, because algorithms are based on our actions in the past, which doesn't necessary lead to our behavior in the future. This gap in technology leaves the need of a stream for us to follow, engage and interact with others. That is why we are building Gignal. We want to make a stream that amplifies peoples voices and images from events. We want to give any person online, access to any event they want to witness through the eyes and thoughts of the people physically present. Gignal takes the physical atmosphere online in a shared world based on a shared experience. We are not inventing a need, we are just supporting what people are already doing when their favorite football team scores a goal and when they win a match - they roar with their mobile phone on social media - and we will echo that on Gignal. The same reaction happens at basically any event where a crowd are sharing an experience. From festivals to world movements as the Arab Spring, where the world joined and supported the young people in the streets of Cairo. 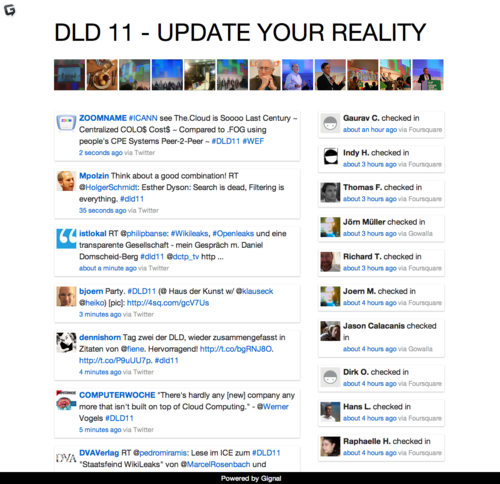 Instead of just following the content on Twitter or Facebook, we want to show all the real-time conversations surrounding an event and across social networks, giving our users a real-time experience. So there is no past, there is no future and there is no end to where our stream will take us, engage us and entertain us - but we want to define it.